Coryphaenoides is a genus of rattails which is found in all oceans of the world. 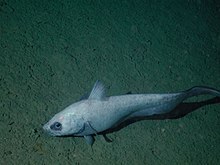 They are found in deep waters and C. yaquinae, recorded to 7,012 m (23,005 ft), is the only member in the family known from the hadal zone. Coryphaenoides armatus is seen in this video describing the operation and use of an autonomous lander (RV Kaharoa) in deep sea research. ^ Sepkoski, J.J.Jr (2002). "A Compendium of Fossil Marine Animal Genera". Bulletins of American Paleontology. 363: 1–560. Archived from the original on 2009-02-20. ^ Bailly N, ed. (2014). "Coryphaenoides Gunnerus, 1765". FishBase. World Register of Marine Species. Retrieved 1 April 2018. ^ Froese, Rainer, and Daniel Pauly, eds. (2016). Species of Coryphaenoides in FishBase. January 2016 version. ^ Linley, T.D. ; M.E. Gerringer; P.H. Yancey; J.C. Drazen; C.L. Weinstock; A.J. Jamieson (2016). "Fishes of the hadal zone including new species, in situ observations and depth records of Liparidae". 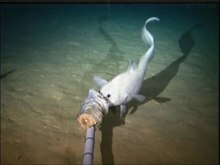 Deep Sea Research Part I: Oceanographic Research Papers. 114: 99–110. doi:10.1016/j.dsr.2016.05.003. ^ a b Nakayama, N. & Endo, H. (2016): A new species of the grenadier genus Coryphaenoides (Actinopterygii: Gadiformes: Macrouridae) from Japan and a range extension of Coryphaenoides rudis Günther 1878 in the northwestern Pacific. Ichthyological Research, 64 (1): 1–12. This page was last edited on 28 February 2019, at 17:56 (UTC).